Few Australian Catholics would recognise the popular beliefs and practices of their Latin American co-religionists. So if I were to make an ambit criticism of Christianity based on the extreme poverty and draconian politics of Latin America, Catholics would be justified in poking their fingers at me and ridiculing my simplistic reasoning. But among those pointing at me in ridicule would be the polemicists and cultural warriors with three fingers pointing back at themselves. Google jihad. Featuring prominently is JihadWatch, a blog moderated by far-right Catholic polemicist Robert Spencer. It takes a certain degree of intellectual laziness (often combined with irrational prejudice) to attribute negative characteristics to an entire group of people, especially when members of this group rarely, if ever, regard themselves as sharing some uniform identity. Do entities such as the Muslim community or the Muslim world really exist? Do all Muslims regard themselves as belonging to the same community of believers? Indeed, do all Muslims regard each other as Muslims? If so, how do we explain the rhetoric of Iraqi Sunni groups who attack Shia Muslim shrines with a view to destroying the infidel? And how do we explain that an elderly Lakemba-based imam who once claimed the title of mufti of Australia, New Zealand and the South Pacific wasn’t recognised by many Australian Muslims as playing any religious role whatsoever? Yet we still see, hear and read of the Muslim community and the Muslim world having a uniform manifestation of faith in a monolithic (usually violent and hostile) manner. We so easily lump together 1.2 billion people in the same category. Riaz Hassan, a sociology professor at Flinders University, argues that the tendency to generalise about Muslims is caused largely by the lack of empirical research. As someone familiar with the literature in this area, Hassan is well-placed to suggest that “sociologically informed analysis that explores the nature and content of Muslim piety remains very underdeveloped”. His recently published Inside Muslim Minds outlines some of the results of a comparative study of Muslim religiosity that began 12 years ago. Just under 6400 Muslims from seven Muslim-majority countries (Indonesia, Malaysia, Pakistan, Egypt, Iran, Turkey and Kazakhstan) were interviewed on propositions covering the nature of jihad, blasphemy laws, segregation and the role of Islam in politics. What is so contentious about claiming that it’s almost impossible to generalise about 1.2 billion people? Where is the controversy in suggesting that a Muslim in Malaysia probably has more in common with a Singaporean Catholic than a Muslim in Morocco? What is so offensive about suggesting that, culturally speaking, Robert Spencer has more in common with former boxer Muhammad Ali than Indian cricketer Yusuf Pathan? I’m not sure. But I do know this: If the likes of Robert Spencer are angered by what I write, it means I must be on the right track. Indeed, indeed… Well said, Irfan. I hope everyone takes note, but sadly too many won’t. 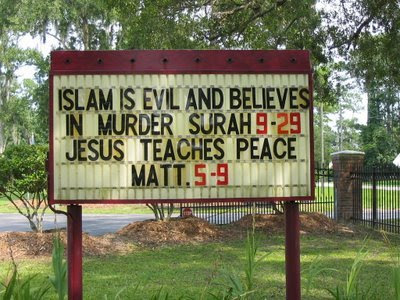 The image above is from Irfan’s entry; I regard any church erecting such a sign as in breach of the most basic tenets of Christianity, bearing false witness by the tendentious selective quotation in the first line, and conspicuously not practising the teaching of Jesus on loving one’s enemies and doing good to those that hate you. But then Christianity too has its “sword verses”: Matthew 10:34 for example. 34 Think not that I am come to send peace on earth: I came not to send peace, but a sword. 35 For I am come to set a man at variance against his father, and the daughter against her mother, and the daughter in law against her mother in law. 36 And a man’s foes shall be they of his own household. 40 He that receiveth you receiveth me, and he that receiveth me receiveth him that sent me. 41 He that receiveth a prophet in the name of a prophet shall receive a prophet’s reward; and he that receiveth a righteous man in the name of a righteous man shall receive a righteous man’s reward. 42 And whosoever shall give to drink unto one of these little ones a cup of cold water only in the name of a disciple, verily I say unto you, he shall in no wise lose his reward. There has lately been a lot on other blogs about Mark Steyn and what is happening in Canada where some, I think, foolish people are attempting to use the law to shut him up. I really do wish he would shut up as I think he is quite pernicious, for reasons I go into a bit in Here was I playing with templates and not wanting to be serious…. I refer you to that. However, as you may correctly infer from what I just said, I think he should be allowed to pollute the minds of his fans, sadly. After all, free speech is one of the things we are meant to be defending, isn’t it? Look, not to show off or anything, but at least to indicate I have seriously thought about these matters over some years, here is a list of the books I currently have in my own library on Islam, terrorism, and related matters, excluding some relevant works on post-colonialism and such matters. Some I have read right through [X], in one or two cases more than once, and others I have read substantially [x], while others I have dipped into. There are of course others I have borrowed from Surry Hills Library over the past few years. Jason Burke Al Qaeda; The True Story of Radical Islam 2004 X Very good. Amin Maalouf On Identity 2000 X — totally wonderful!!! Meanjin 65:4 2006: Zeitgeist: Our Post-Secular Age X — there are a number or relevant pieces in that. For one extremely sane and balanced take on these matters, see Charles Notess. Salam Cafe: Way Better Than Rove! If you feel that some Australians are downright racists, watching SBS will single-handedly swat that notion away with its excellent selection of foreign movies, programmes and locally produced programmes, like the previously-featured East West 101. This is the 118th post tagged “Islam” on this blog and a new tag on Lines from a Floating Life Apr 06 to Nov 07 leads to 71 more. (That’s about 10% of my posts in all.) Before you make a comment, you might look at those posts, but if you don’t have time for that, perhaps especially read three: the recent one mentioned above; this one from 6 June; and Everyone has an opinion about Islam… from January 2008. That might just save me having the same conversation all over again! 5) Reading Robert Spencer’s latest book or citing “the Politically Incorrect Guide to Islam” does not make you an Islamic scholar. Neither does reading the Koran. Proper knowledge of the faith requires interaction and instruction from practicing, learned Muslims. Also, expand the reading list to include books from actual Islamic scholars, so you get actual interpretations of Islamic faith from living, breathing Muslims. While not inclined myself to become a Muslim, I have had interaction with a number of practising, learned Muslims, as well as reading about the subject in books like those mentioned above. You will find some internet resources on my links page and on the blog roll.